MAD MEN's Jared Harris Joining POMPEII!! 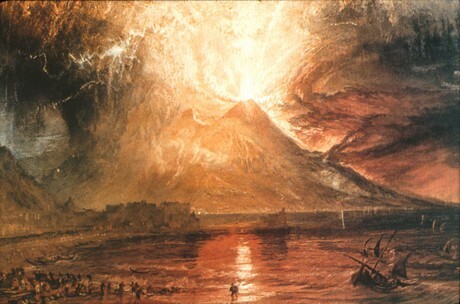 The good news is there's a POMPEII movie on the way (yes, this has been announced previously). And it oughta look pretty amazing given the whizbangery and technology which can be currently brought to film and television projects of this nature. The bad news? Paul W.S. Anderson is directing it. Which means the film will almost certainly be handsomely shot and well designed, but will also be a wreck in nearly ever other regard (I have a feeling PWSA peaked with the unnerving and well-mounted EVENT HORIZON back in 1997). THIS piece in THR says MAD MEN's Jared Harris is joining the cast of the film, which already has four writers (Lee Batchler & Janet Scott Batchler (BATMAN FOREVER (? ), Julian Fellowes (DOWNTON ABBEY) and Michael Robert Johnson (2009's SHERLOCK HOLMES). Milo (Game of Thrones' Kit Harington), a slave-turned-invincible gladiator who finds himself in a race against time to save his true love Flavia (Emily Browning), a wealthy merchant's daughter who unwillingly has been betrothed to a corrupt Roman general. Look for POMPEII on screens in 2014.